One of the benefits of owning a flat panel television set is the ability to mount it on the wall for a better viewing experience. When you install the right wall mount, you never have to look at it or think about it again. However, you do need to consider the viewing experience you would like to have when selecting a mount for your flat panel TV. Where Will You Put the TV? If you plan to watch television at eye level, a basic fixed mount will work fine. It gets a little more challenging when you plan to place the TV above eye level. You will need a tilted mount that allows you to angle the set towards you and the other viewers. This ensures a good picture quality because it reduces the brightness that comes when you place the TV at an angle. A tilted mount can also help to reduce neck strain from looking up at the picture on the screen. A full articulating mount is a good choice if you occasionally pull your TV away from the wall and move it side to side or up and down. This type of mount is appropriate if you have more than one viewing location. You need to be able to angle the television set correctly whether you are sitting down or standing up. The wall mount you purchase should include all necessary hardware and it needs to be sturdy enough to hold the TV in place indefinitely. Make sure the kit has a variety of studs for different types of wall material. 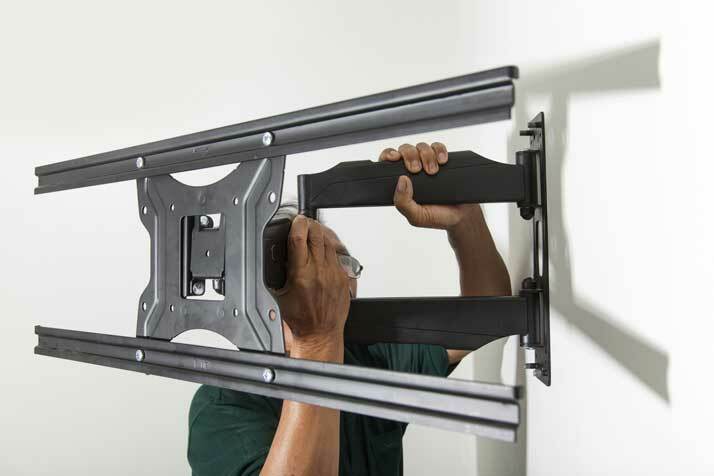 Since you might adjust your wall mount after it's in place, look for one that is flexible enough to allow this. A leveling feature is critical since you don't want to end up having to remove the wall mount and start over if it's crooked. Lastly, look for a wall mount than enables you to attach a small lock to prevent theft.